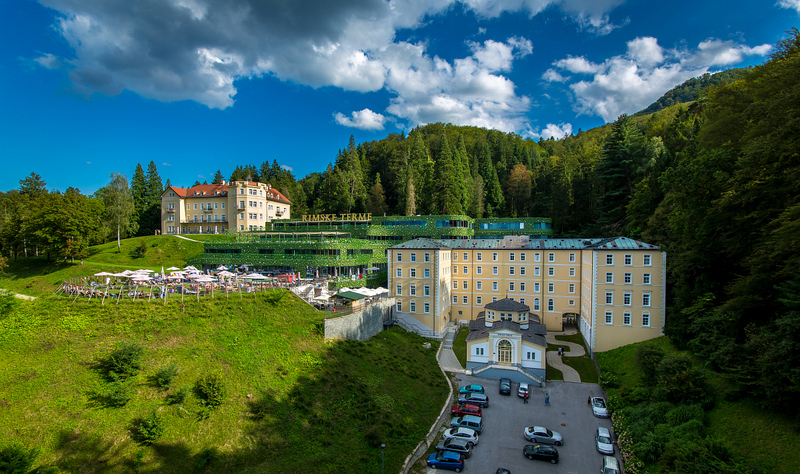 With more than 2000 Years of Tradition, Rimske Terme are the oldest thermal spa resort in Slovenia. First mentioned in a written document of Aquileia in 1486, they really came to life after 1840. After 1848 the resort was visited by many distinguished guests -English Princess Victoria, the Princess Murat. In the period from the end of World War II and until 1991, the resort was managed by the Yugoslav People’s Army. During these times the healing powers of Rimske terme were only avaliable to certain high-ranking officers. 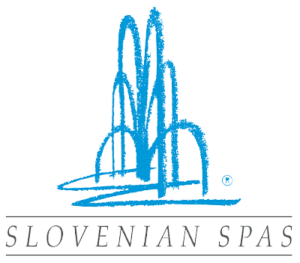 The thermal water of the Rimske Terme is one of the richest and most healing in Slovenia. It is proven to help treat orthopaedic and neurological disorders, rheumatic and gynecological diseases, arthritis, conditions after orthopedic and trauma surgery, skin disorders, pulmonary and respiratory diseases. An excellent location with intact forests is beneficial to chronic respiratory diseases. The springs in Rimske Terme are located approximately 1,000 meters below the earth’s surface. Water from the Spring of Amalija has a temperature of 38.4 °C and the water from the Roman Spring has a temperature of 36.3 °C. Lovers of cultural heritage, excursions to the countryside and shopping will be truly delighted. At your request, individual trips can also be organized, provided with a guide who speaks your language. Other options include rafting on the Sava River, a walk through the city of Radeče and Laško, tour of the Laško Brewery with beer tasting, visit of the Laško Museum or a trip to the valley of Carthusians. Sports activities in Rimske Toplice offer cycling, Nordic walking, skiing, tai chi, and hiking. World of saunas VARINIA “Roman way to health and relaxation”. For complete relaxation and body regeneration we have added three new outdoor saunas and renovated five indoor saunas, tepidarium, cold and hot pool, chromotherapy and relaxation corner. Rimske terme – synonymous for a timeless elegance of ambient, high standard equipped suites, superb cuisine and unique wellness services. A unique swimming pool designed in ancient Roman style and nymph baths – the powerful and abundant ambience with 2000 years of tradition offer an extraordinary thermal bath experience. Roman massage – Treat yourself in the style of the ancient Romans with candlelight Roman music and the sound-healing gong bath. Touch of Slovenia’s massage -The wrap and the scrub with clay in addition to the salt have a strong detoxing effect and abolish muscle tension. A combination of the best local dishes with selected nuances of international cuisine. 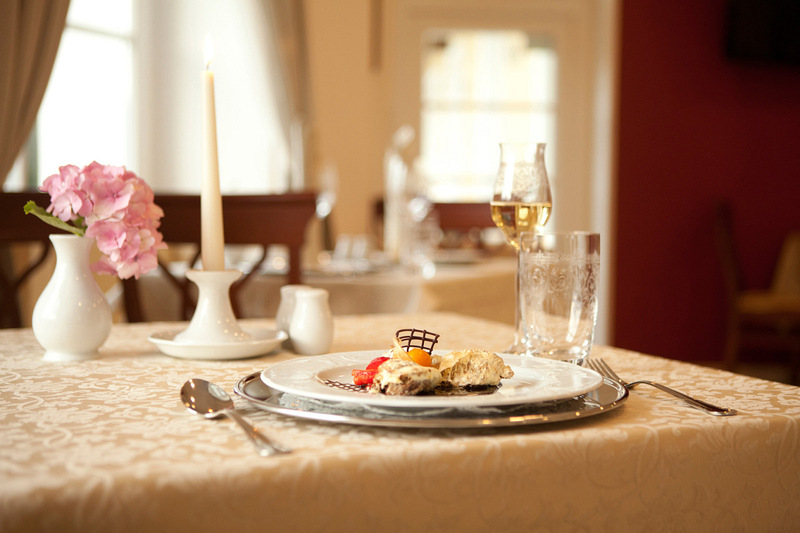 The dishes are prepared in a modern way according to the philosophies of the Viennese and Mediterranean cuisine. Furthermore, the menu composition is adapted to seasons and fresh seasonal ingredients from the surrounding areas of Rimske Toplice. The Sofijin dvor **** is furnished in a classical style of timeless elegance. It offers 43 luxurious single and double rooms and hotel suites. The most beautiful rooms have a balcony or terrace overlooking the mountains in the back, the mysterious Savinja River and the little Church of the Lourd – Mother of God. Hotel Rimski Dvor is situated between the Sofijin dvor Hotel and the Zdraviliški dvor Hotel and forms a bridge over the history of Rimske terme. The hotel consists of terraces and is perfect for creative work and the creation of new ideas. You can let yourself enjoy the comfort of 68 top-class double rooms and suites with eight special suites equipped with a sauna, whirlpool and a round bed. These suites hold a special story and their names are derived from the Latin names of healing herbs and fruits from Rimske Toplice. 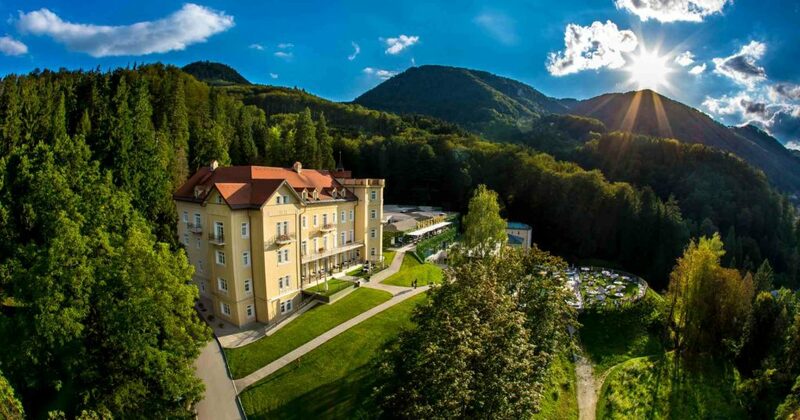 Hotel Zdraviliški Dvor **** offers 76 single and double rooms and suites where you can regain your energy. Four rooms adjusted to the needs of movement-impaired are also available for booking. Villa Sisi **** is located in the heart of nature, amidst green surroundings, surrounded by a magnificent park and it impresses all who are looking for peace and a genuine contact with nature. There are three modern apartments available for the guests who want to relax in the nature. Each apartment consists of two separate bedrooms, a living room, entrance hall, small kitchen and a bathroom. The services offered by the spa have a beneficial effect on health and are therefore an excellent choice in preventing the occurrence of the above-mentioned and other diseases, and similar inconveniences. After all, the spa is a suitable place to retreat from the crowded everyday life, to relax and gather new strength. The process of spa treatment can include up to 23 healing therapies in one week. In such cases, the recommended accommodation period at the spa is at least 14 days. During this time, the ingredients and therapies absorbed by your body will achieve the maximum effect. This time frame can also be extended based on a doctor’s proposition. Let go and enjoy life just like the ancient Romans did. The swimming pools filled with thermal water are designed along the lines of the Roman baths and cover 450 m2. 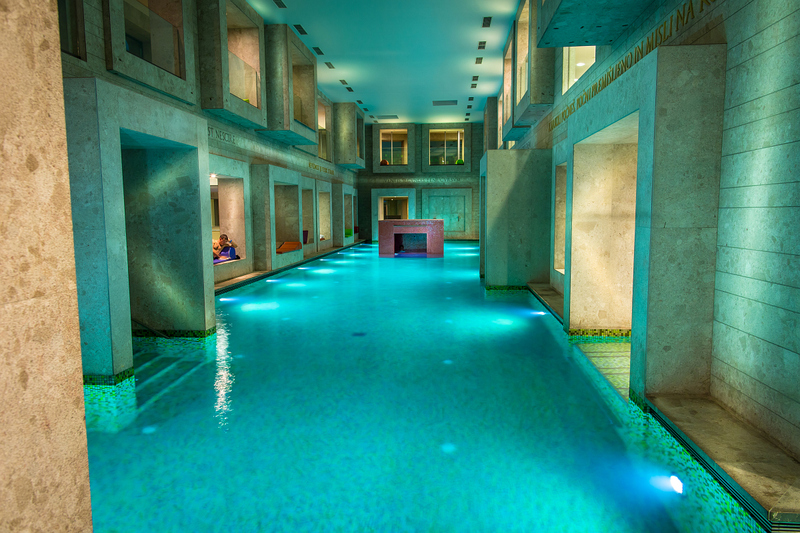 Rimske Terme holds an indoor and outdoor panoramic swimming pool, 4 indoor and 3 outdoor massage pools with water seats and beds. Find your inner peace in the Sauna Land Varinia equipped with Roman, Finnish, Turkish and infrared saunas. After the sauna, indulge yourself with wraps, scrubs, swirling air and undergo a Kneipp cure. You will get rid of everyday worries in 4 authentic stone baths from the Roman times and 6 modern baths to be enjoyed with your partner in the historical part of the water nymphs, whereas strengthen your immune system and restore your positive life energy with healing springs. Massages and body care treatments with intoxicating essential oils and delicate touches will help you regain your strength and health. We offer unique massages and an overall pampering experience for all the senses. In addition to internal beauty, we also help you to cultivate your external beauty. Indulge yourself in a complete facial and body treatment (manicure, pedicure, waxing and cellulite therapy) in the beauty center. Furthermore, the hair studio and solarium are also at your disposal. The Spartacus Fitness Center is available to everyone who wishes to maintain his/her physical condition. If you wish to further revive the spirit and your body, you can attend yoga classes to be held at energy points.